This one took a while to form up, but I'd say the effort was worth it. I mean, it's fan-made characters based off of characters from some of my favorite books of all time! What can be better than that? Whatever the case, here they are, my fifth OC Team... Team C.L.V.R.! - Shoulder strap is to the backpack she carries with her, usually full of notebooks, writing/measuring tools, and extra ammo clips. - Scar is from a mishap that happened during training (addressed further in Known History). -Emblem is stitched to the left shoulder of her shirt and printed onto both sides of the stock on her rifle. -Shorts extend just past the knees and appear to have been fashioned from a pair of jeans. -Leather hiking shoes (medium-wide) are worn from use and covered in grass stains, dirt, and other discolorations. -A holster is worn for her hunting knife, which rests on her left thigh. Personality: Always the type to talk things out, if the option comes to mind as possible. While normally positive and sociable, she swaps to a very serious persona when in combat. Always willing to learn, she is keen to knowing when mistakes are made (failure to do so tends to lead to slight disorientation). 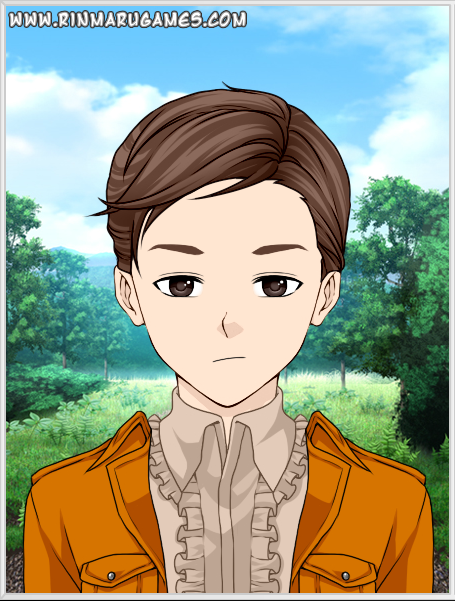 Known History: Born and raised on the outskirts of Vale, she wasn't looking into becoming a Huntress until one day, at the age of eight (before she had gotten her rifle), her home was attacked by a pair of bandits. They had claimed to be part of a cult that learned the ways of Aura outside of society teachings before killing both parents, though not before the father overtook and killed one of them before they could harm Davina, allowing her to escape. Now driven to learn of what those two meant by Aura and to find a way to pursue them at their own game, she entered herself into Signal Academy under false credentials to begin her training in the ways of combat and knowledge of Aura and the special abilities known as Semblances that it enables. With this knowledge, she deduced, she would be able to find a way to get past the issue of Aura in dealing with those that would use it maliciously. It was during this training that her passion towards her goals made it ironic that her Semblance would reflect it, making the pursuit of that knowledge all too easy. It was when this Semblance was uncovered, however, during a training match in Signal at the age of 15 (which was presumed to be 16 by everyone else at the time, given the false credentials maintained over the years) that a mishap occurred where she lost her grip on her hunting knife and it slit her left cheek, right across the cheekbone at that. In any case, being granted this Semblance, she decided that her efforts would be better spent in improving her combat skills and trying to make connections between Semblance and person and how they relate to each other. 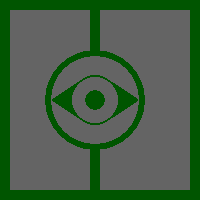 After graduating from Signal, she decided she would spend her time studying her hypothesis that Semblance is directly related in some way to the person that utilizes it. In this, she would use her own against those that have shown to have unlocked theirs to study the persons in question to get a feel for who they really are. By correlating what she learns between these two, she finds herself ever closer to the answers she's looked for all those years... But then again, it's only been a year of study. Not only that, but it's not unknown that the mentioned cult is still in action... If anything, it would suffice to assume that perhaps theory and end goals may coincide... Only time will tell, as she's eventually met up with several other individuals, agreeing to work together in a time of need as Team C.L.V.R. Semblance: Power Reader- Can focus a small bit of Aura on an individual to get a read on their Semblance (including advantages/disadvantages) and their current Aura level. What is learned from this ability is retained, but it takes about 10 seconds before the ability can start gathering this information and another 10 seconds before the information is relayed back to the user through the same Aura sent. Hunting Rifle/Knife- Two separate weapons, these are surprisingly generic for a Huntress to use. The rifle is standard, medium caliber, using 8-guage rounds and 4 shots per cartridge. The hunting knife is equally standard, with a 6-inch-long blade and rubber grip, but made from imported Atlas materials for exceptional performance and durability. The rifle is about a decade old and is obsolete compared to other rifles, but the knife tends to be replaced when a better one is introduced. Fighting Style: As a sniper-class fighter, she prefers to keep distance while, at the same time, using her Power Reader ability to figure out the best way to engage her opponent. Once this is done, she utilizes what she has to take the opponent down from afar. If this can't be done by the time she runs out of ammo, or the opponent manages to get close enough, she will resort to use of her hunting knife to get the job done if possible. If she can't pin them down, she uses her combat training to get out of the situation as soon as she can to recover. -Emblem is stitched to the back of his leather jacket, mirrored behind either shoulder. -Wears thick blue jeans, faded, but without holes or tears. -Dusty white sneakers, snug fit, but not constricting. 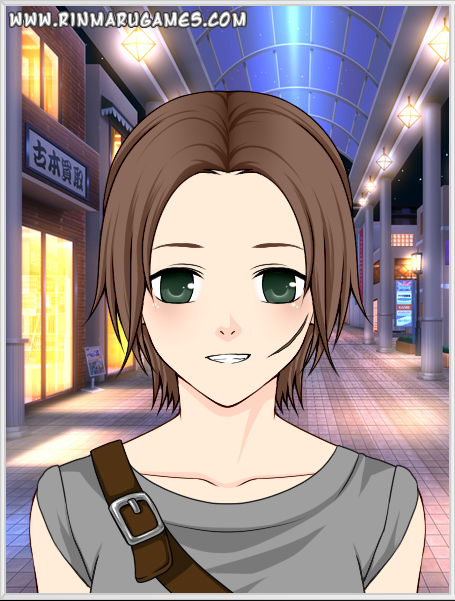 Personality: Generally good-natured and self-disciplined, he doesn't prefer the description of self-righteous, given the negative nature of the term. Even so, he usually struggles to compensate for his relatively poor temperament. Being driven into a fitful rage is almost always followed by crippling guilt and confusion towards those he wrongfully harmed. Despite this, when he feels comfortable with talking about his problems, he usually finds himself to be somewhat relatable to other people and their own problems and will even offer to help out a little bit, provided that such an action is appropriate. Going back to the self-disciplined bit, given his insistence towards right and wrong, this is usually what accounts for his temperament, as he prefers to confront opposition directly with few words of negotiation before action is taken. Known History: Born in the city of Vacuo, his life was... semi-decent at best. His father was strict and his mother was... well... not around much. It didn't really help when, at a relatively young age, he had succumbed to a rare illness. Not wanting to wait for it to either kill him or leave him slimmer than the odds of a butterfly vs an Ursa, his father made the decision to abandon him to the outskirts of the city to fend for himself. While he did make a rather miraculous recovery, that may well have simply been because he had a little help from those that took pity on him (or had help from other relatives that didn't approve of his father's decision). Once he was of age, he took it upon himself to enter a low-tier academy under a false alias: Lou Veritas, but the moment he'd graduated he'd completely vanished from the world without a trace for several months. In his reappearance, however, it was under his original name instead of his former alias, initially leaving everyone in the city to wonder why someone that SHOULD have been dead a couple years back suddenly turns up months after the disappearance of a near-identical academy student. Even so, pieces were put together and it was figured out eventually. This did not, on the other hand, stop him from doing everything in his power to help out the local people, all the while doing so outside the law. He may still be a young one, still at the age of 16, but he utilizes his abilities (his Semblance especially) to strike fear into those that dare break the law in his home town... kinda like the kid version of Batman, only not dark and mysterious... or resembling a bat...This in mind, it's a tad curious that he'd agreed to be led towards a goal that doesn't involve remaining in his home town, as a member of what is now Team C.L.V.R. Semblance: Flames of Fury - Allows for the user to project Aura-generated "flames" from the entirety of the lower arms (hands included). These "flames" can be launched from the user's arm via a punching motion. Generation of these "flames", matching the color of the user's Aura, burns through Aura at a very slow rate, but damage inflicted is localized to the area of impact and does not spread. The maximum reach for each launch varies, but can be as far as 20 feet away. Estuans Euphorbiaceae (means "Burning Isolation") - No one really knows where the Fire Dust crystal came from, as of current (but presumably in the Dust mine that had, since, been abandoned), but as it's carved from the core of the largest singular crystal ever discovered in Vacuo, the REAL question is how it seems to have a mind of its own. Whatever the case, it is contained in a seal that controls it's abilities, such as firing bolts of Fire Dust energy by pressing any one of the eight buttons or, if a certain number are pressed at one time, release or retract eight curved blades of solidified Fire Dust. This can then be thrown like a small glaive (yes, it does always come back, like a boomerang, before you ask). The seal itself is also backed so that the Estuans can be worn by the user like a large amulet (which is a twist-lock fixation to the chain for said amulet). Fighting Style: A mix of boxing, kickboxing, and kung fu, use of the weapon is ACTUALLY rarely necessary, as it'll sometimes fire bolts all on its own (presumably on cue) to catch an opponent off guard. When use of the weapon IS necessary, however, rapid fire is usually employed, followed by activation of the blades to throw it as a means of either long-range attack or distraction to get in close. Whether or not the weapon firing on its own is intentional is... up for debate. Even so, careful use of Semblance plays a big role in the outcome of any fight, be it against a pack of Grimm or a gang of thugs. Other Notes: In regards to the allusions, the Semblance, abilities, and Aura color tie together attributes from both Louis AND Zuko into a sort of hybrid that I felt just seemed right. 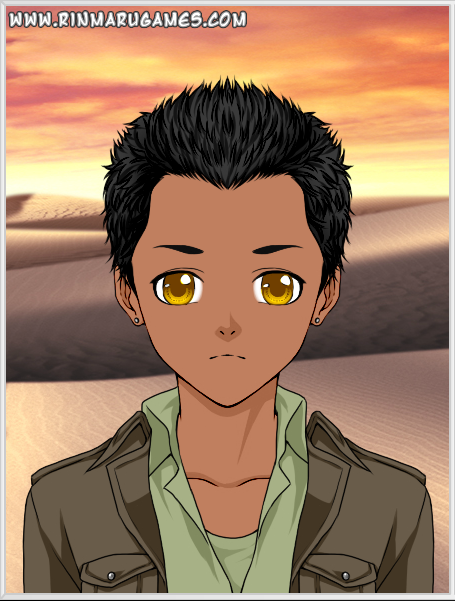 The appearance I based off of Louis (I forgot if there was anything about his shoes, so I just took a wild guess since I didn't feel like digging through the book to find out), but the eye color is entirely Zuko's. As a balance to this, I made the history and personality lean more towards Zuko, but with elements towards Louis as well as my own sort of mix so that it makes more sense (the false alias, like what Zuko used when he was in the Earth Kingdom, was my spoof of Louis' name, in case you didn't catch that). 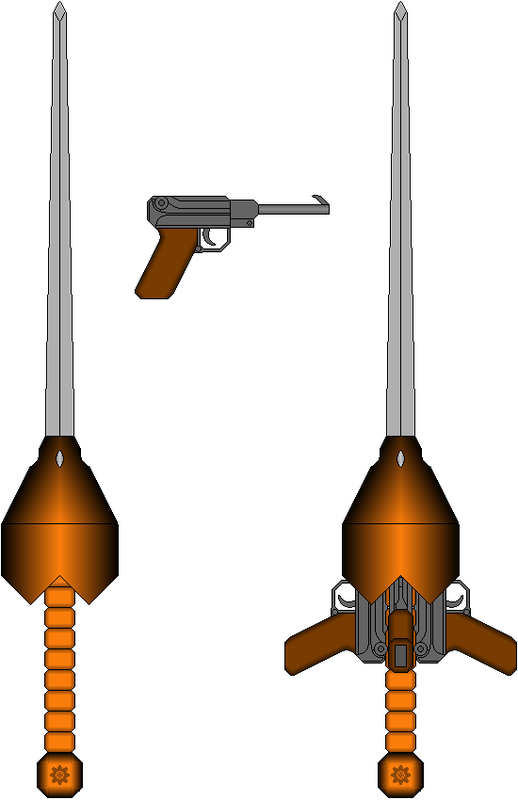 The weapon is similar to what Louis uses, but given a more pyrotechnic approach to keep Zuko in the mix here (the blades and firing of energy bolts are entirely my own idea, mind you). The age is pretty young for his abilities, I'm sure, but bear in mind that Louis, in the book, had abilities -at the age of 13- that made Zuko's look like cheap pyrotechnics. I DID decide to make him 16 instead to make the abilities more plausible as a result. The strengths and weaknesses are just a blend of both and whatever I felt made sense for a RWBY OC. Feel free to speak up if anything still seems a bit out of place. Strengths: Some mechanical prowess, especially in terms of weaponry; Adept at fencing (though not necessarily professional or anything like that); Prone to understanding of the positions of others; Wide range of knowledge in many fields, such as dialect and sufficiency; is very well able to cover for himself, even if not with others for support; what isn't known, he can learn fairly quickly and effectively. Weaknesses: Pride in himself tends to cause trouble where trouble shouldn't have come up; current lack of experience holds him back from getting ideal results (though that's probably just a given); forgiveness is slow-coming to those that wrong him, friend or not, making it difficult for one to get a point across once he's been upset by them; can be easily distracted by something he greatly admires or knows little about. Personality: A bit arrogant, but he's not above redemption when proven wrong. He's normally careful not to make enemies when it's not necessary, if he's not already been provoked. Give him a helping hand, though, and you're more likely to get on his good side. He's kind of the "Treat me as you want to be treated back" sort of guy, though he's not above considering that rule for himself towards others. A bit of a smart-alec when it comes to other's faults, but only when he feels he can take the chance to without causing backlash on himself. Of course, the same goes for when he's the one being teased, only it's more likely to cause a bit of frustration than to be simply shrugged off. Still, he does hold morals such as right-or-wrong, so at least he can tell his way around... even if it does mean shouldering his pride. That aside, he holds significant value towards the unknown and what potential it may have in it, like a weapon, the type of such he hasn't seen before, or a means of doing something that he'd never considered. 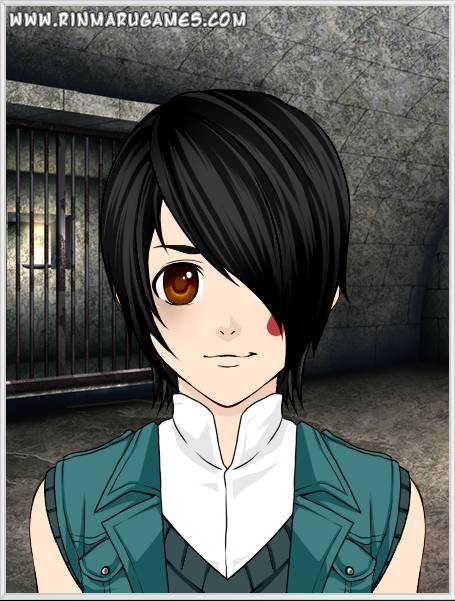 In this, he tends to be the curious type, always fascinated by that which is new to him. Known History: Formerly the son of a nobleman that lived in the mountains of Atlas, Boran had the easy life... if "easy" meant being home-schooled what he could have gone to an Academy to learn, and he was pushed to learn what he could, given the political tension that'd been building after the Vytal Festival took a bad turn. 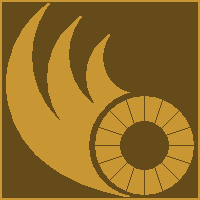 When a small group of Faunus workers, under the assumption that the Vural family may have had part in encouraging discrimination in the workforce, took matters into their own hands and assassinated both of his parents, Boran was escorted out of the manor by his tutor and trainers, ensuring that he would escape via airship while they stayed behind to hold off the attackers as they moved to kill him next (at this point, he'd still been trying to learn more about his Semblance and what it might be). Escaping to Vale, he only found more people influenced by the clear bias against Atlas when a group of distraught rioters attacked the airship as it landed just outside of the city, killing the pilot as Boran fled south into the forest. He'd gone into hiding since then, but was able to find that the tension eventually subsided in the central region of the Sanus continent, so he found himself able to roam about the villages without nearly as much worry about being randomly attacked. Instead, he had a new issue: figuring out what the heck he was going to do for a living. After all, he's not technically a Huntsman, and it's not like his Drachenzahn would make people get the wrong idea, even with him looking for other occupations... though that didn't stop him from being recruited to aid a building group of individuals, now known as Team C.L.V.R. Semblance: Not presently known, at this time. "Drachenzahn" Pistol-Housing Rapier - The name means "Dragon Fang" in German, which is fitting, as the Luger-like pistols use Fire Dust as the ammunition and the rapier itself is no slouch at piercing OR cutting into armor, light or thick (depending on the material). Generally wielded with one hand means having a decent blade in one hand and a somewhat decent pistol in the other, making a hardy combination for any opponent to deal with. Once all four pistols are used up, the rapier's handle allows for it to be held with both hands for better control. Fighting Style: Uses his fencing training to good effect, he is adept at maneuvering Drachenzahn to even block rapid-fire shots for a short period of time with minor to medium difficulty (depending on the intensity). Paring this defensive advantage using the rapier with also wielding one of the four pistols makes for an... interesting time for any opponent, though Grimm would be less than likely to overthink this, being the general idea of dual-wielding in the first place. Even so, Boran can also catch an opponent by surprise with firing any of the pistols while they're still in the hand guard housing, taking care to use this sparingly as an element of surprise. Known History: Mistral's former prodigy before being overshadowed by rising star Pyrrha Nikos (which was rather humiliating, as she never really spent much time socializing with her, being new and all at the time), she felt it unnecessary to attend the recent Vytal Festival with more than enough representatives (even if a few weren't directly representing Mistral) already attending, in her opinion. As such, she did not enter her team into the Festival (she wasn't so keen to let them be part of a competition anyways). With fame through being a top-notch Huntress in training no longer much of an option, she opted to instead renew her claim to fame as an avid competitive gamer, when she wasn't busy with studying or training. This did, however, end up reducing her learning performance with grades and such. Considering this, she found it a bit curious that Professor Lionheart agreed to letting her graduate early so she could investigate what was going on in Vale after the event of Beacon's fall, but shrugged off any doubt, considering the situation. Her investigation... didn't really get very far as most of the damage done had already been repaired by the time she got there, so she instead decided to look for other options until she could find a better lead than an abandoned underground encampment that had already been cleared out... One of such options turned out to involve working with a fellow Huntress towards research of her own, eventually grouping up with two others to form Team C.L.V.R. 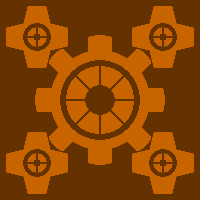 Semblance: Inventory Displacement - Anything the user carries, such as weaponry or Dust cartridges, can be teleported from their stored location to another withing close proximity to the user. For example, a gun in a holster on the user can be teleported into their hand to fire. Aura cost for this is very low, but also dependent on the mass of the item "displaced". -Note: I'm aware that this might be taken as something similar to the "Requip" ability of Fairy Tail's Erza Scarlet, but bear in mind that this is supposed to resemble more accurately a real-time representation of inventory interactions in a game from the character's perspective. Just something to think about. 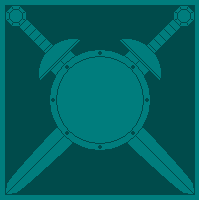 "Goln-Armory" Broadswords, Shield, and Blasters- Exactly as they appear. 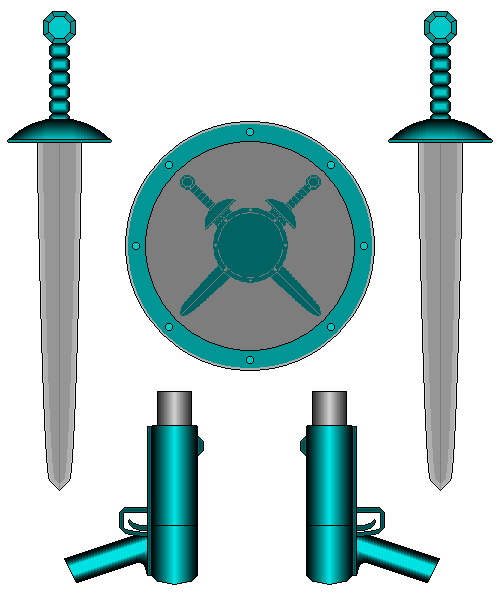 The broadswords are of a very durable material, favoring sturdiness over lightness (though the weight is no concern either). The shield is a reinforced, tempered alloy that ensures that it'd sooner break whatever weapon strikes it than be broken itself, making up for it's relatively small size with reliable protection. The blasters each use a Electric Dust power cell to supply a small energy cannon, the entire middle of the blaster (between the grip and the barrel/firing mechanism) being dedicated to reducing the recoil from such. The shots from these can also disperse to affect enemies in close proximity to each other. All of these are simple, yet very effective when used properly. 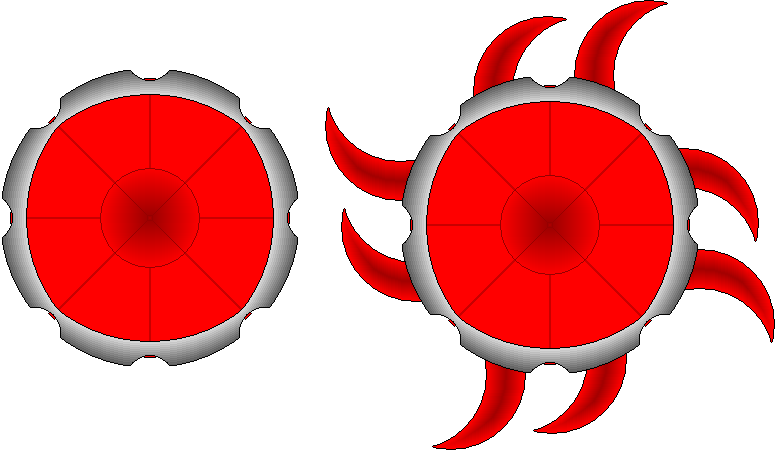 Fighting Style: Having preference towards dual-wielding, the shield is commonly displaced into position on the left lower arm when facing larger or more challenging opponents, usually leaving the respective hand to be armed with one of the two blasters. However, when Rooke wants to make things interesting, she'll ignore using the shield altogether and rely on agility rather than her shield for defense, opting for mobility over durability. In either case, she commonly uses the same weapon type to dual-wield, but occasionally mixes things up when the situation requires a more all-round approach. As she and a purple, lynx-eared Faunus girl left the inn, Davina Celik turned to the girl in remembering something she'd forgotten. "Oh! Before you go, I forgot something." "Hm? What would that have been," the girl asked in her endearingly high voice. "Try not to move," Davina said, though this didn't really answer the question. Instead, she raised a hand towards the girl, a small ball of Aura with a dull white glow formed from her palm as this sped into the girl. "Agh! What the heck was that?" "Hang on, this'll only take a moment. I promise this won't hurt you." Davina wasn't lying. What she had just done is infused a small portion of her own Aura into that of the girl's, allowing it to gather information on the girl's Aura status as well as her Semblance in detail. A short time after, the same ball of Aura shot out of the girl, only this time tinted with the same color as the girl's Aura, returning to Davina. Upon retrieving this, dozens of images flashed through her head, such as a silhouette of the girl showing the intensity of her Aura levels and images of the girl shifting into the form of a lynx, being the girl's Semblance. After a couple seconds of this, Davina gave her a smile and said "Just had to make sure you weren't lying or anything. Nothing personal." "Ok, but what was that?" "Just me using my Semblance to confirm yours." "That's your Semblance? COOL!" At this she let out a light squeal at how the inquisitive nature of the Semblance matched her focus on gathering information. "Aheheh, take it easy, would ya? All it does is tell me what your Aura level and Semblance is, making it only good as a one-time use, so it's nothing particularly dependable." "Are you kidding? I would totally use the crap out of it!" She'd continued on about why she would, but Davina had spaced out, as she was getting flashbacks of a rather dark event in her childhood. This was something that happened on occasion when she'd think about what she's been interrogating people for. She was only eight at this time, that night. Her parents had made plans to enroll her at Signal Academy and made a reservation ahead of time, but there were people that had other ideas. That night, two shady individuals visited their house, which Mrs Celik answered the door for, only to be bashed over the head and shot several times until dead, allowing the two unhindered passage into the household. Davina's father made a run at them, but was stopped short with a gun to his head and a couple pats of a club. With them no longer being interrupted, they spoke up as Davina entered the room. "Thought you'd secure your dependence on a useless society, eh?" the one with the gun said in a nasal tone. "Where we come from, Aura ain't for governments to teach, but of our own hands! Repent your ways!" Not in the mood to hear such rabble, Mr Celik took a step forward and hit the man hard with a right cross, but in a flash of light, the punch was negated and the man's head was simply turned lightly, possibly mockingly. "See?" the man continued, "Ya can't hurt us! You reserve your kid to a place of false teaching, yet you don't even know what you enroll her in yourselves! Come on! Try a little harder!" At this, he turned his head again and tapped his cheekbone, again to mock. Instead, Mr Celik jumped on him, struggling to instead break his neck rather than beat him into submission, which he eventually did, but not without also being beaten harshly with the club from the other man, who continued to say nothing. Terrified by this, Davina fled from the house, taking advantage of their distraction as the scene fades out. "Erm... hey! Lady? Can you hear me?" The girl had noticed that Davina had spaced out and was trying to snap her out of her saddening expression, which eventually worked. "Hm? Oh! Sorry! I was just thinking about something and kinda forgot you were talking... Again, sorry!" She put a hand to her forehead as if to make sure she didn't catch a fever or anything from the flashback and sighed in relief at the fact that she hadn't gone cold from the recollection. "Ok, but it looked like you were about to have a mental breakdown," the girl said, a bit concerned, "I know my dad's supposed to be training me to be merciless and all, but that's not stopping me from feeling bad if someone's going to collapse just from a casual conversation..."
"I know, I get it, it'd be like making hash browns only to get an omelette." "Uhhhh... What? No seriously, I don't get it." "Well, you cook strips of potato for hash browns, right? Well wouldn't it be weird to get an omelette instead of hash browns? I mean they are both made on a stove..." The analogy wasn't quite as bad, upon explaining it, as the one she had made earlier, but it was still a bit... off. "When were you planning on telling me about this, Felina," a gruff voice demanded. "Mote, calm yourself, the lady very clearly did no harm in the matter," a more gentle yet firm voice said in response. "Yeah! Come on, Dad, it wasn't anything particularly sensitive. She even paid for it and said it was for research purposes." Felina, at this point, seemed to be trying to speak in defense for Davina, but the one called Mote wasn't having it. "I won't stand for it. Not without knowing exactly what her motives are." With this, we hear a rush of air, followed by a man quickly yelling after someone, probably Mote. "Oh come on! Y-stil o-me amatch!" Davina was busy picking off a few Borbatusks from a distance, the Ursa with them wary of her location and blocking a few of the shots, so she'd pulled out her hunting knife to move in up close to kill it the hard way. Halfway to closing the gap between them, however, a red concussive blast obliterated the Ursa, the blast stopping Davina in her tracks. She turned around quickly to catch a glimpse of a dark man in a black trench coat, wielding two very lethal looking gauntlets, though not getting a good look before the man dissolved into a cloud of dark mist, dropping below the grass to advance on her undetected. Not in the mood to be snuck up on, she turned to run instead, which motivated the man to revert to his normal self to unleash a couple more of those blasts in front of her to either side before calling out, "You can try, but you can't run from me. As a father, I want to know your motives for interrogating my daughter." Irritated at the man, having revealed himself to be the one that the girl from before had called her adopted father Mote, and his aggressive means of getting her attention, she snapped back, "Like hell I'm going to tell you if you're going to keep shooting at me!" Without another word, he simply started walking towards her, allowing her a better look at the gauntlets, consisting of four blades and a large firing mechanism with a cone-shaped barrel and a ring of Fire Dust around the cuffs, presumably the Dust storage, though there were several hoses attached to either ring, suggesting a Dust pack that he would be wearing on his back. What was even more unsettling, however, was that as he walked towards her, the blades were starting to glow an ominous red. Snapping her gaze to his eyes to try to read his intent, Mote simply said one thing: "If you don't prefer being shot at... Perhaps you'd rather be swung at until you start answering my questions." He took several swings and jabs at her, which she struggled to direct away with her knife while trying to find an opening for her to get him off of her... but couldn't find one. Instead, she had to continue blocking and moving back while trying to maneuver her rifle with one hand to get a shot off so that she could try to pin him down that way. That didn't really work either. With how each magazine she had carries only four rounds each, all she could really do was stall him as she made enough distance to give time for the next magazine. Then she thought of something... He hadn't been able to land a hit on her while she hadn't had as much difficulty, so he had to be running low at SOME point. She'd already seen his Semblance in action and combat logic stated that he couldn't be any better off than her in Aura, so there was no point in using her Semblance here... She just needed to wear him down, but he had other plans. Not in the mood to persist in a failing strategy, he dissolved into a cloud of mist once again. Instead of running again, however, Davina stood her ground and took this opportunity to ask a simple question: "What are you so hellbent on asking me that you would go out of your way to assault me over it?" The mist, rising from the grass, reverberated in a curious manner around her, creating sound waves to mimic Mote's voice patterns to give a single question in response: "What is the purpose of your interrogations?" A curious method, but effective nonetheless. "I'm trying to research the relationship between people and their Semblances." "Not good enough," Mote replied through the mist, reforming behind her to strike. With a yell, she turned quickly in a high kick to direct the blow away as she had also positioned her rifle for a potshot aimed for where it REALLY hurts, which hit its mark successfully. Letting out a shout of pain, Mote instinctively bent down and curled up from the shot, allowing her another shot to the side of his head to knock him the rest of the way over and break his Aura. Knowing that he could try to get in more shots from the gauntlets, she decided she'd simply sit on his back, with her feet holding down his wrists as she made her say in the matter. "You really want to know so badly why I need to do this? Fine, but you'd better not tell the girl especially of this. It's personal reasons that she doesn't need to know... You see, I guess you could say my ambition for it first came up after my parents were murdered by these two people that spoke of Aura like they were part of some anti-government cult... To this day, that night has haunted me, yet also drives me to find out more about how Aura and Semblances work... Also maybe pay them back in kind, if I ever run into them again" With a sigh, she continued, "So there, now you know. That enough for you or what?" "Are you going to get off of me, now?" He merely asked for the sake of asking, because he had recovered enough to simply get out from under her himself anyways, but the information seemed an honest enough answer that being rude like that wasn't necessary. "Yeah, sure. Gods, you're a tough one to simmer down..." With that, she rolled herself off of Mote, who got up to straighten himself out. "Naturally. You're a perceptive one, yourself, with aim like that." "Yeah, but the only mags that still exist for this model of rifle are only the recreational versions, which only carry half the rounds, which is a huge hindrance for me." "And you never thought to get a newer model that hasn't become an antique?" "Hey! This is a very decent rifle, and I've had it for over a decade! I wouldn't part from it for anything." The suggestion was pretty offensive, given how accustomed she is to the old thing. No wonder though, with how accurate she is with it. "Right... That will be all then." With that, he dissolved into a cloud of mist once again, leaving her to her bearings, but not before the fighting between them had attracted the attention of several Grimm that had decided to choose that moment to start closing in on her. At this, she gritted her teeth and took aim as the scene fades out.